I don't mind admitting this one caught me completely by surprise. Sure, I know Ronnie Wood, who doesn't? He's in the Rolling Stones, he messes about and has a laugh with Rod Stewart who he was in The Faces with, he paints and he makes solo records. However, I'd not sampled any of his solo records, because, frankly, I didn't think Ronnie was much cop in the vocal department and I doubted I'd enjoy a full album of his. Well, I was wrong - yep, there, I've said it, because I ended up liking 'I Feel Like Playing' a lot. I was initially drawn to this because it came up as a potential album for Fireworks to cover - apart from Ronnie himself having more than enough rock heritage to justify it, his guest list on the record pretty much demanded my attention... appearances and contributions from stars such as Billy Gibbons, Flea, Slash, Kris Kristofferson, Bernard Fowler, Eddie Vedder, Bob Rock, former Faces band mate Ian McLagan... not bad eh? So I approached the album thinking it may be one of those all star projects under the artist in question's name, like Slash's last album. That is not the case, what we have here is very much a Ronnie Wood album, where the guests complement, rather than detract, from the whole affair. Opening with the Kristofferson co-write 'Why You Wanna Do A Thing Like That For', the first thing I notice is Ronnie has decided to keep his vocals in his lower register. It's a bluesy-country track and while Wood's croaky rasp isn't going to be troubling Glenn Hughes anytime soon, it suits the song very well. Indeed, as Ronnie candidly explains in my interview with him elsewhere, the songs were written deliberately for his natural vocal range, unlike his previous efforts where he has found himself screeching because the songs were too high. Once you're used to his almost Bob Dylan-esque delivery, the album holds a wealth of great material. 'Sweetness My Weakness' offers a reggae vibe which again Ronnie manages with surprisingly effective results vocally. 'Lucky Man' picks the pace up a bit with Bob Rock joining Wood on guitar, before 'I Gotta See' takes things down. As bluesy ballads go this is hard to beat, and Ronnie is helped out in the vocal department by the always excellent Bernard Fowler. Bernard doesn't overpower Wood's singing, but he is prominent enough to smooth things out. Fowler's vocals are all over this album, and as co-producer that's no surprise, but he never overwhelms Wood so it always sounds like a cohesive solo record. In fact, the only times his voice comes to the fore is in a segment of the funked up Howlin' Wolf classic 'Spoonful' and on the closing ballad 'Forever'. My personal favourite is 'Thing About You', co-written with Billy Gibbons and featuring the ZZ Top star's trademark guitar tone. It (unsurprisingly) sounds like The Stones meets The Top, and its a great bluesy rocker which once again Ronnie handles well. 'I Don't Think So' is straight out of the Rolling Stones playbook and there's some excellent slide guitar work on the grooving 'Tell Me Something'. Despite having blues, rock, country, funk and reggae flavours, the album flows beautifully and with true solidarity. It's really impressed me and is a great album to work to. The guests all make valuable contributions without stealing the limelight from Wood himself, who has gone up in my estimation tenfold. 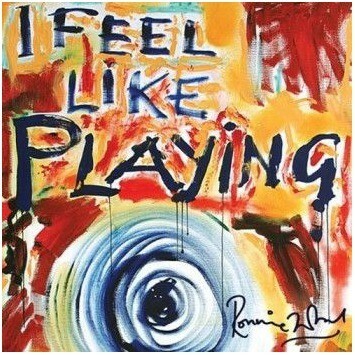 Despite all the stars, it's a true solo album with Ronnie writing or co-writing all the songs (except for 'Spoonful'), handling the lead vocals, guitar, some bass, some keyboards... and he even painted the cover. Well, he can colour me duly impressed. Excellent!